>3M High Performance Masking Tape #232 3/8 in. x 60 yds. 3M High Performance Masking Tape #232 3/8 in. x 60 yds. 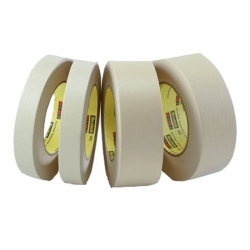 3M High Performance Masking Tape 232 is capable of masking paint while removing cleanly. Its thick crepe paper backing contains a solvent-resistant saturant that helps resist paint bleed against latex- and oil-based paints. 3M High Performance Masking Tape 232 conforms well for masking around corners and over irregular surfaces. The rubber adhesive sticks instantly and offers strong holding power that resists lifting, curling, and adhesive transfer when removing from surfaces like EDPM rubber moldings. This tape delivers superior performance as a paint masking tape for demanding applications. The crepe paper backing tears easily, offers moderate conformability around corners and over irregular surfaces, and lifts off cleanly. The natural rubber adhesive bonds well to paper, metal, wood and painted surfaces with reliable holding power and conformability. Under normal operating conditions, 3M™ High Performance Masking Tape 232 features one piece removal without slivering. 3M High Performance Masking Tape #232 1 in. x 60 yds.